It’ll be a family affair tonight in Minnesota as the Rangers (19-9-4) begin a two game road trip, and another back-to-back series when they take on the Wild (16-7-6), who are in the midst of an eight game point streak. The Rangers returned home for a single game on Monday night, and it was exactly what the team needed as they were able to snap their three game skid and come away with a 4-2 win over the Oilers. Dylan McIlrath scored his first career goal and Rick Nash netted the game winner, putting the team back in second place ahead of the Islanders. This is the first of two meetings between these teams, with the next matchup coming on February 4th at the Garden. The Rangers won both games against Minnesota last season, including a thrilling, come from behind victory on October 27th, scoring five goals in the third period to overcome a 3-0 deficit and two ejections. 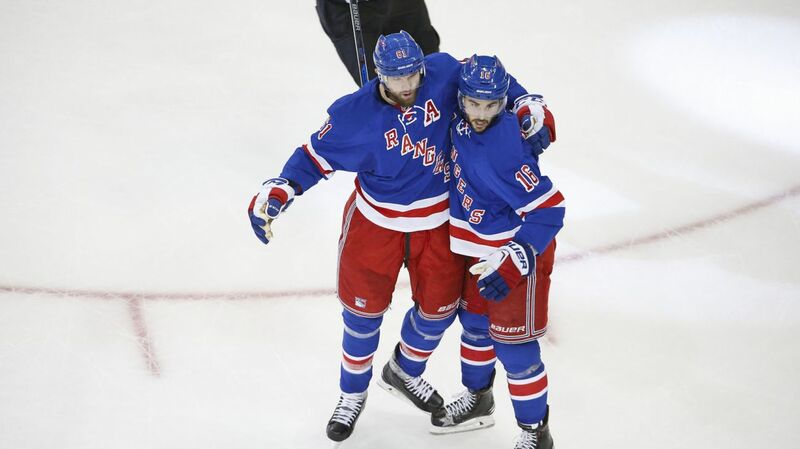 Derick Brassard had a goal and three assists in those games, and Rick Nash tallied a pair of goals. The Wild have remained competitive in the best division in the NHL, currently in third place in the Central Division, tied in points with the Blackhawks but with three games in hand. They’ve been excellent defensively, surrendering just 68 goals, which comes out to 2.34 goals against per game. Darcy Kuemper briefly took over as starter for the last five games, going 3-0-2 and giving up just six goal with a .943 save percentage. But Vezina finalist Devan Dubnyk has recovered from a minor groin strain, and he’ll be back in net for Minnesota. Dubnyk has a 2.30 GAA and a .918 save percentage. Three days ago Jarret Stoll was in a Rangers practice uniform skating under the guidance of head coach. Tonight, Stoll will play against the Rangers, with Wild head coach Mike Yeo giving the veteran center the start on the fourth line. Stoll has won 57.9% of his draws, so it’ll be interesting to see him square off against Dom Moore. Jarret Stoll will debut for the Wild tonight. Photo courtesy of Getty Images. Also, I’ve watched enough Rangers games to realize that Sam Rosen has said “insert name here, a former Ranger, scored for insert current team here,” or something along those lines. Former Rangers tend to score against the team all the time. Stoll isn’t an offensive powerhouse, but it wouldn’t surprise me if he managed to light the lamp. The Wild have a couple of really good scoring options, like Zach Parise (10-8-18), but the combination of Mikko Koivu and Thomas Vanek is especially deadly. The two highest scoring forwards play on the same line, with Koivu already collecting 19 assists and 25 points, and Vanek leading the team with 11 goals. Ryan Suter is one of the best and most reliable defensemen in the NHL. He regularly plays upwards of 28 minutes a night, and he’s tied for seventh in the league in scoring amongst defensemen with 22 points (5-17-22). Henrik Lundqvist will be in net for the Rangers tonight after picking up his 15th win of the season. It marks the 11th straight season that he’s won at least 15 games, giving him the most 15-win seasons in franchise history, a mark previously held by Mike Richter. Brady Skjei had an impressive NHL debut on Tuesday, logging 15 minutes of ice time, including some big minutes on the penalty kill. The Lakeville, Minn. native grew up 35 minutes from the XCEL Energy Center, and will have a ton of family and friends in the stands, and he’ll be really energized for this game. Ryan McDonagh grew up even closer, in the same town as the Wild’s home stadium, so he’ll have his family and friends there too. 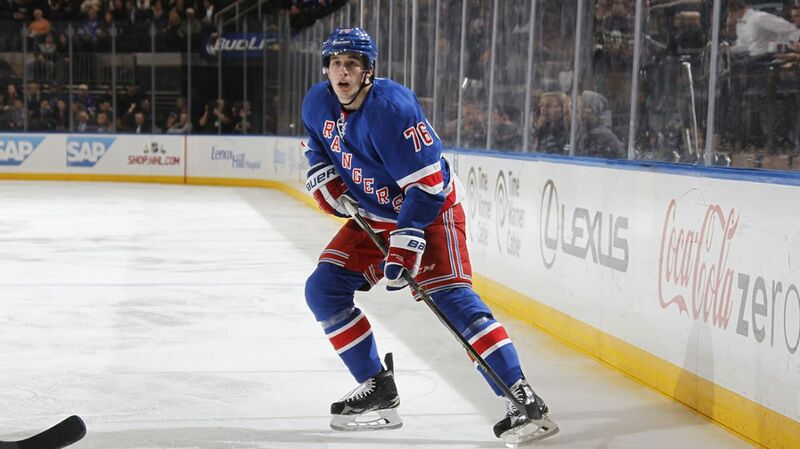 McDonagh played well with Marc Staal, not hampered by Dan Girardi’s terrible possession numbers. The top pairing looked well, and I think McDonagh will have a strong game again. The top line has been outstanding. 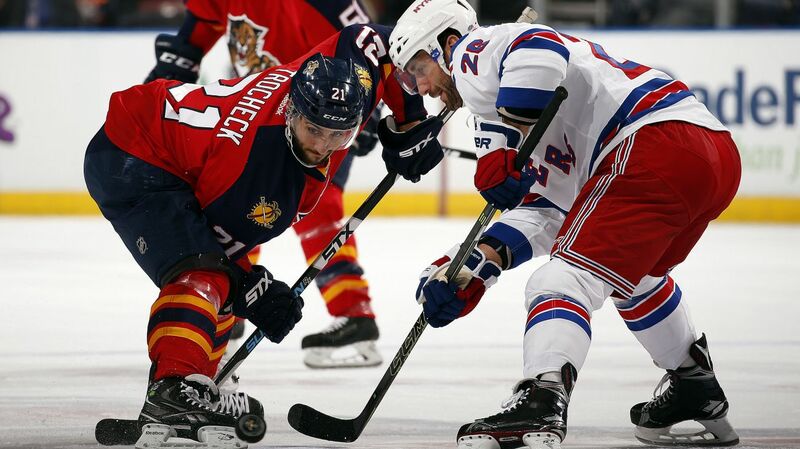 Mats Zuccarello has scored in three straight games, giving him 14 goals and 27 points through the first 32 games. Derick Brassard has scored nine points (5-4-9) in the last eight games, and Rick Nash scored the game winner against Edmonton, his 10th goal and 23rd point of the season. They’ll play a big part tonight as well. 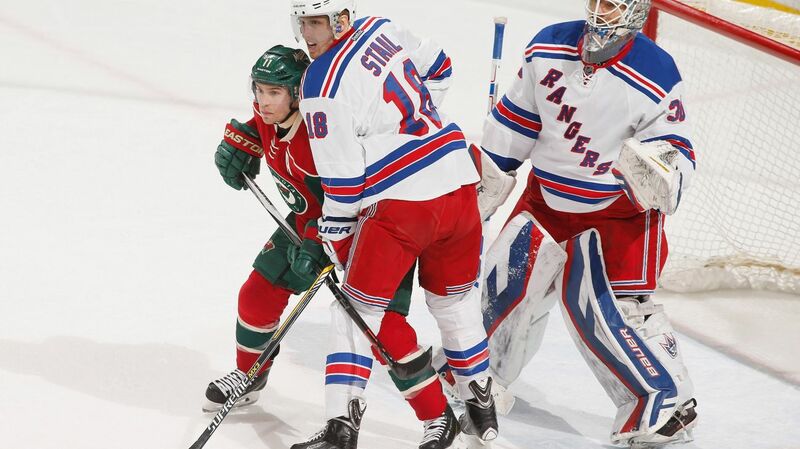 The Rangers and Wild will face off at 8 PM at the XCEL Energy Center. The game will be broadcasted on MSG Network. Posted on December 17, 2015, in Game Previews and tagged Alain Vigneault, Antti Raanta, Chris Kreider, Dan Boyle, Dan Girardi, Derick Brassard, Derick Stepan, Dominic Moore, Dubnyk, Dylan McIlrath, Emerson Etem, Henrik Lundqvist, Jarret Stoll, Jesper Fast, JT Miller, Keith Yandle, Kevin Hayes, Kevin Klein, Madison Square Garden, Marc Staal, Mats Zuccarello, Minnesota Wild, MSG, New York Rangers, New York Rangers blog, NYR, Oscar Lindberg, Parise, Rangers, Rangers blog, Rick Nash, Ryan McDonagh, Ryan Suter, Stepan injury, Stoll waivers, Stoll Wild, Viktor Stalberg. Bookmark the permalink. Leave a comment.